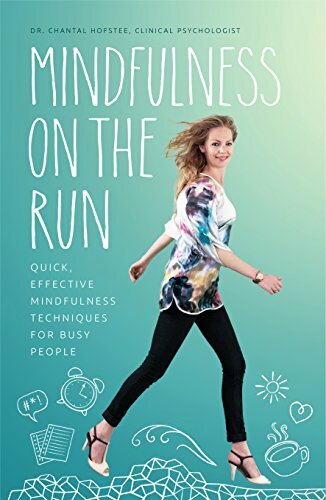 "I found Mindfulness on the Run easy to read and the techniques seem achievable within my busy life. If you want to give mindfulness a go but thought you just don't have the time, then this is the book for you." Mummahh "... simply don't have time for anything else? This book offers a quick and effective program to help you slot mindfulness into a busy life. For more information and stockists, visit exislepublishing.com.au" Better Homes and Gardens "Clinical Psychologist Dr Chantal Hofstee developed an easy-to-learn program of techniques that can be done anywhere, anytime." Australian Ageing Agenda "Psychologist, wife and mother, Dr Chantal Hofstee understands the busy woman and offers quick,effective mindfulness techniques to help you get your life back on track" Take 5 Magazine "If you're one of the people who says you would be more mindful if only you had the time for it, this is your book. It can quickly become a friend in your search for greater peace, ease, and joy." New Spirit Journal "Think you are too busy to practice mindfulness? This program is for you." Good Health Magazine "This is well-written, researched extensively and it's a practical handbook. It flows well from one learning onto to the next. As you understand, one chapter expands into the next. This handbook is one resource that's easy to read, informative and supports busy lifestyles." PS News "a quick effective programme that enables you to slot mindfulness into your life"
We all know how good mindfulness practice is for us, but how do you implement it in your life if you're so busy you simply don't have time for anything else? This is precisely where Mindfulness on the Run can help. As a busy psychologist, wife and mother, Dr Chantal Hofstee has developed a quick, effective program that enables you to slot mindfulness into your life without the need for formal meditation practice. The result will be a calmer mind, less stress, more focus, greater productivity, increased efficiency, enhanced creativity, and most importantly, a happier, more enjoyable life. Packed full of practical exercises that can be done in minutes, this is mindfulness that can be done anywhere, anytime - even when you don't have time!